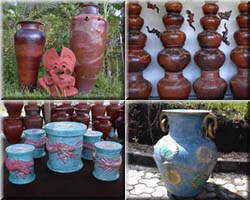 ... you can make your house and garden special with handmade ceramic from Bali. Designs from the past and for the future. Thousands of years experience give this products not just a special design, but also a soul. We will show you some of our collections. Pottery, garden furniture, and statues, all sizes, with decorations or just simple. will fit your garden, terrace or by your front door.